Every year I look back to see what i've accomplished. Looking back at this year there was much sadness as well as much success. My hope is that I will continue to advance and improve my craft each and every year and looking back helps me reach that goal. When I look back at 2017 I see that my photography has improved and that I put myself in situations that were out of my comfort zone, which is a good thing. No matter what the task, you need to push your limits to learn. We all learn to crawl, walk and ultimately run. The path is full of bumps and bruises along the way and my photography is no different. My year began with a model shoot with Devi. She is a very experienced model and made my work easy to accomplish. This was my second shoot with her and my fifth model shoot overall. People ask what I hope to accomplish by paying to have models pose for me. First, it allows me to try things that I wouldn't normally be able to try. Second, I was able to pick the poses and take my time playing with the lighting. I didn't feel rushed or beholden to anyone else. I am my own client. Personal dissapointment and being out some $ is the only downside. Devi, January 2017. Fuji XT1, 56mm f1.2 Lens, off camera flash in a soft-box with a black backdrop. My son actually helped me with this image, unbeknownst to him. I wanted to practice with the off camera flash system I was going to use and he helped out by being my subject. My Son. January 2017, Fuji XT1, 56mm f1.2 lens, off camera flash in a soft-box with a black backdrop. I then headed off to the Mendocino coast to Fort Bragg and the city of Mendocino. This turned into an epic six and a half hour trip that should have taken me a couple of hours. A nasty storm arrived just as I was starting my journey. I found this grove of trees and they screamed to be photographed. Fort Bragg, CA. Fuji XT1, 18-55 lens. Your probably saying to yourself, why all black and white? I've always loved the look of black and white and when it comes to my personal work this probably won't change any time soon. My next adventure was a trip to a local park. 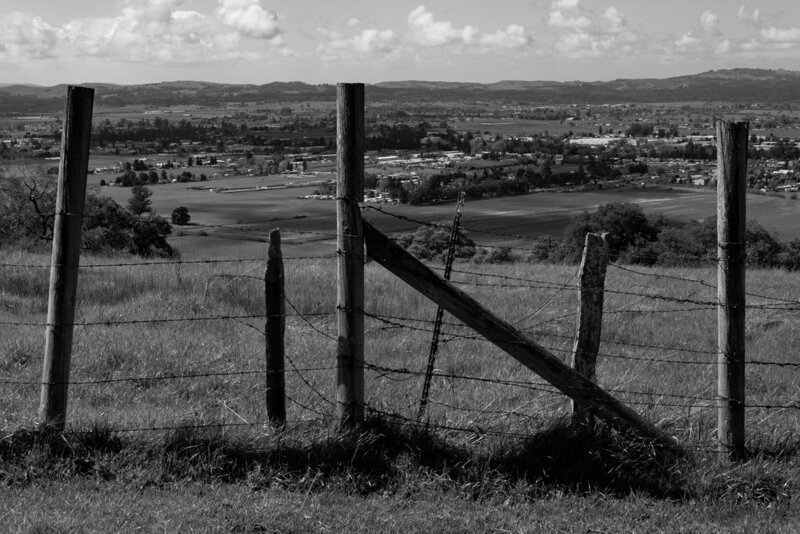 Taylor Mountain Regional Park has broad sweeping views of Sonoma County and I found a spot that sang to me. Taylor Mountain Regional Park, Santa Rosa, CA. Throughout the year I was lucky enough to have worked with some amazing people, providing them with portraits. The middle of the year hit me like a brick. My Father passed the end of July. 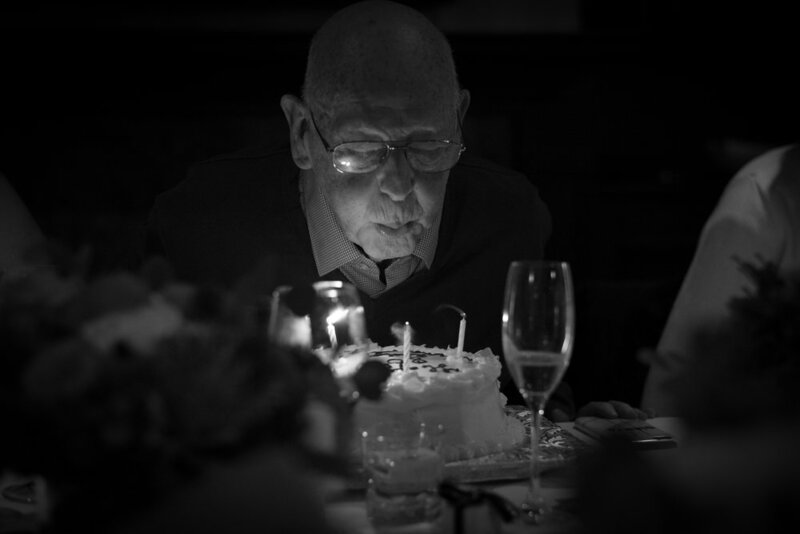 I had photographed his 80th birthday the year before and had one shot that I absolutely love. I took that image and wrote a a blog post. It was therapy for me. Through this article I was able to process some of my feelings as well as some self reflection. Petapixel picked up the article and published it on their home page. This was a major accomplishment for me coming from one of the worst moments of my life. The original post can be read by clicking the image below. My Dad on his 80th Birthday! I then had a session with Diandra Godiva. This was a fun shoot with a new model I discovered on Instagram. The mechanics of photography take less thought for me than the content of the image. I have been struggling to make what I consider to be amazing images. As an artist I am never happy with my work and always looking at what I could have done different. This shoot just worked. It felt right to me. I didn't struggle to find the image, they just seemed to happen. Diandra was a pure joy to work with and I feel more confident than ever after our shoot. Sure there are things that I would do differently but I have learned something. Casey Neistat once said "Don't let perfection get in the way of good enough." My whole life I have been using that as an excuse not to try. Well I'm trying now and I will keep on trying because I have no other choice. I am my photography and my photography is me and I will never apologize for that! Diandra Godiva, Fuji XT1, 56mm f1.2 lens, natural light. I ended the year with a trip to Lake Tahoe. The Fall colors in full effect. It was a quick trip but one that I will always remember. I shared it with a lifelong friend, sharing stories, the good, bad and the ugly. We hiked to a place I thought I'd never see again and he photographed me there. Desolation Wilderness, Eagle Lake. iPhone Panorama. This is an epic journey we are all on. I am choosing to do this with mine. This is my passion, third in line after only my Wife and children. So I hope you enjoy it with me and that you have something in your life that brings you as much joy as making images does for me. Delolation Wilderness, Eagle Lake Trail. Fuji X100T.